﻿Although ten years separate the gigantic composition "Le Sacre du Printemps" and the dance cantata "Les Noces", the more recent work has several things in common with its scandalous predecessor. 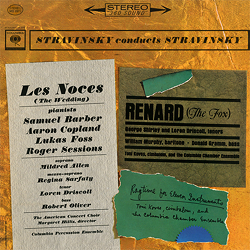 Originally Stravinsky planned to use a vast orchestra of 150 musicians, but decided after numerous attempts to settle for four pianos, percussion, voices and mixed chorus. Concealed behind the innocuous title is not a peasant wedding but once again an archaic ritual, »which takes possession of several of the central figures, drives them on and eventually crushes them with its unrelenting movement« (André Boucourechliev, Igor Stravinski, Fayard 1982). Ballet, rhythmic dance through and through, fuses with Russian melodic song and thereby exudes a folkloristic exoticism.